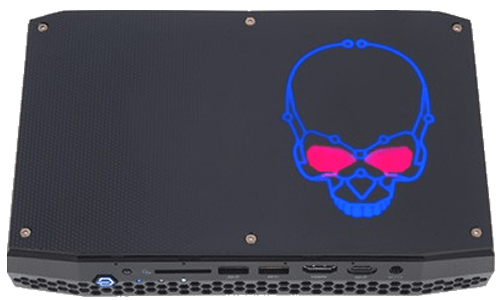 The Hades Canyon NUC (Next Unit of Computing) is Intel’s latest super small computer that’s running a new Kaby Lake G GPU. If you don’t know what is, it’s a small computer that Intel makes every year, called a NUC. 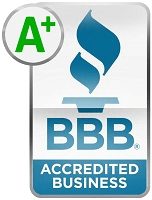 With each year they get better and better, and this one kicks it up a notch or two! 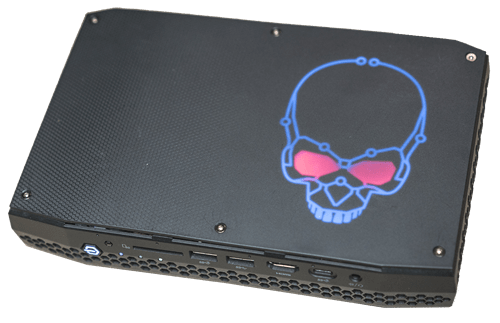 This NUC is running a new 8th generation chip that combines an Intel Core i7 with a Radeon RX Vega M GPU. 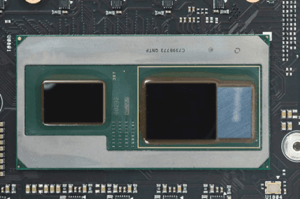 It’s a collaboration between Intel and AMD to make this extremely efficient CPU, and that’s what’s powering this device. The thing that makes this guy so special is its size. This thing is only 1.2 liters in size. It is, however, a little bit bigger than the previous generation, but it’s still super small. You don’t get cases like this very often. There is an external AC adapter which you obviously plug up to this, but the unit itself you can leave out as a media center unit, or even leave it out on your table if you really like small devices. I didn’t use this device as a laptop, what I did was have two AC adapters and kept one at home and another at work. That way I was easily able to transport this NUC back and forth without any problems whatsoever. With these PCs being so small they are very versatile like that. This one is a bare-bones unit. That means it doesn’t come with RAM, storage or even an operating system. It means that you have to go ahead and open it up and put the system in yourself. 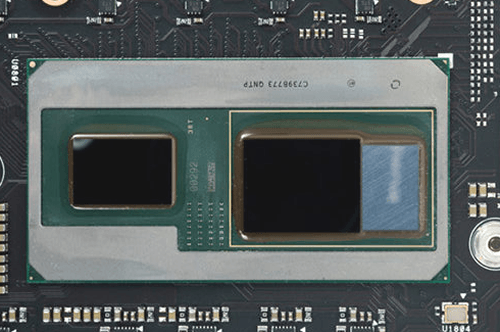 There are two NVME slots and two RAM slots, so you can get up to 32GB of RAM. And it’s really easy to build into the system. Thankfully, it’s easy to get into and once you’re inside you may be a bit surprised at how small it is and yet they can still get everything inside all the while still maintaining all of the functionality. This little unit actually has a crazy number of ports. There are six USB-As, two HDMI, two Thunderbolt 3s. Front and rear audio, two mini DisplayPorts, an SD card slot, and, for kicks, an additional USB-C port. That’s enough for a pile of USB devices, a Thunderbolt NAS, wired internet, and six 4K displays. And even then you’d still have a spot to park your favorite pair of headphones and hook up an audio receiver via mini-TOSLINK optical. As you can see this is completely riddled with ports. But despite only being ports and grills all over its shell, it still looks really clean. 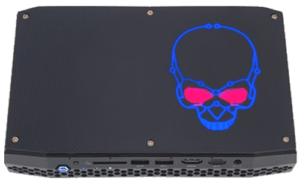 When I first saw the outside of it the skull was lit up blue and also red, this seemed to make sense because the blue represented Intel and the red represented the GPU. However, upon closer inspection, I realized that this has a fully adjustable RGB spectrum. Every single light, plus the skull and eye sockets are adjustable. If you want you can kill all of the lights as well and just go dark. When you have all of the lights off on the unit there is no visible sign of the skull, it’s completely subdued. The performance of this machine is quite good. 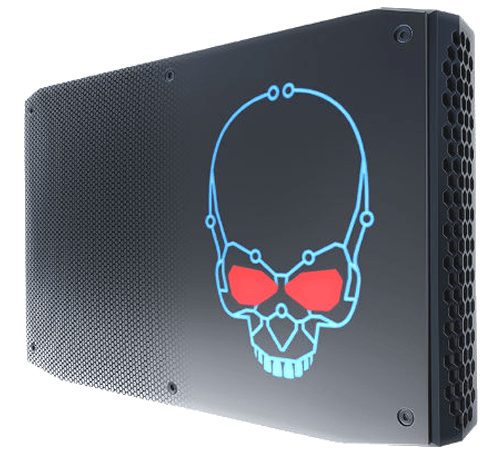 It’s running the highest-end Kaby Lake G chip, so the i7-8809G and it is a quad-core CPU with hyper-threading. We ran a bunch of benchmarks and it put up some strong numbers for the clock speed because it has the Kaby Lake architecture and not the Coffee Lake architecture, but more interesting was the GPU performance. The Radeon RX Mega M GH is close to the GTX 1060 but not quite as powerful. It’s more similar to the 1060 Max-Q, also a very capable card so you’ll be able to hit 60 frames per second on most Triple-A titles. Granted, you will probably have to adjust your graphics settings a bit, but overall, I’m impressed and it’s running some earlier drivers. There’s always room to improve over time. 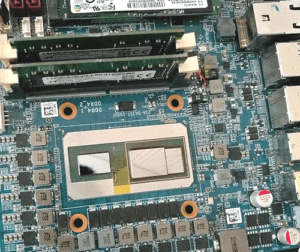 What makes this so cool is that the CPU and the GPU all fit into here on one chip. It’s a 100-watt TDP package and on games like Doom, it’s pushing out 85 fps in ultra graphics and 1080p. Keep in mind this is all being done in a super tiny 1.2-liter machine. Talk about good things come in small packages! Also, Virtual Reality (VR) is actually capable on this. It’s not a VR monster so you won’t be able to keep up with the higher resolution of the Vive Pro, but it will handle the regular HTC 5. Thermally it’s also quite good. The default settings won’t have any kind of throttling. You can overclock it but there doesn’t seem to be any substantial gain if done. One of the first things you’ll notice when booting this thing up is just how silent it is. The Skull Canyon NUC from last year was pretty quiet but it was still audible even on idle. This one was quiet when first turned on and the fans did pick up a little bit under a light load and this was still a very quiet even under a heavy load, was very quiet still. If you’re thinking about licking this little guy up you should expect to spend anywhere between $800 for the base model up to $1,000 for the higher-end model. To me, the premium that you pay for something this compact and packed with such good performance isn’t that huge. Considering what this thing is capable of, I think it’s a very reasonable price. It does have limited upgrade capability because it’s fairly difficult to get that CPU out. 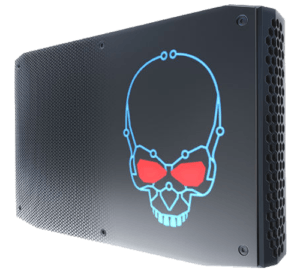 But if you’re looking for a small, light and relatively powerful PC, check this Skull Canyon NUC out.